When the Bolsheviks seized power on 25 October (7 November New Style) 1917 they had three strategic objectives: Bread, Peace and Land. They moved rapidly to exit from World War One, and ceasefires and local armistices soon emerged. On 2 December (15 December), Russia signed a short Armistice agreement with the Central Powers at Brest - Litovsk. This Armistice held until 17 / 4 February 1918 when Germany gave 7 days notice of its intention to resume hostilities - which it did on 24 / 11 February when the successful Operation Faustschlag was launched with the aim of forcing Russia into signing the full Treaty of Brest-Litovsk. An English version of the Armistice agreement can be accessed via the Wikipedia article "Armistice between Russia and the Central Powers". It provides, among other things, for the exchange of unsealed mail at the front("between sunrise and sunset") and sets up a commission in Petrograd to work out the details. This provisional measure is very different from a full resumption of postal relations, with mail heading by train to Petrograd from Berlin and vice versa. It basically expresses an intention to give civilians access to the military field post at front-line exchange points. 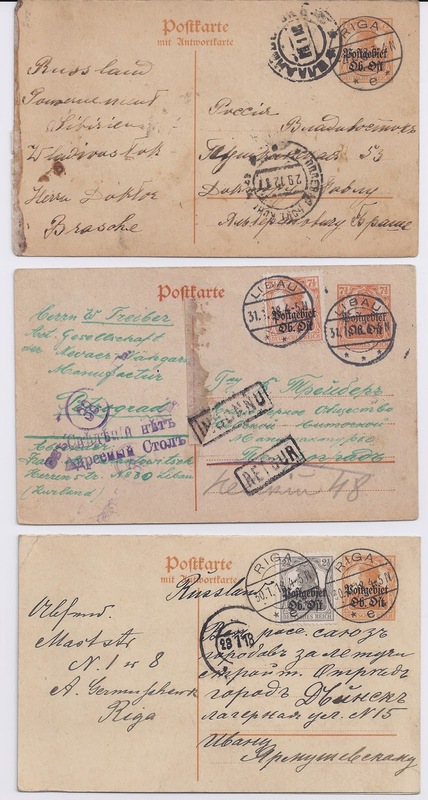 The collection of Harry von Hofmann sold recently at Heinrich Koehler in Wiesbaden included some examples of such Armistice mail from the German side. Some of it is puzzling and in the absence of the text of the arrangements agreed by the Petrograd commission, it's necessary to guess what is happening, though Alexander Epstein published some information in Yamchik (June 2005). The second card, also in German and asking for material help, starts in LIBAU 31 1 18 with a 15 Pfg franking and is addressed in both German and Russian to a company office in Petrograd, where it could not be delivered. 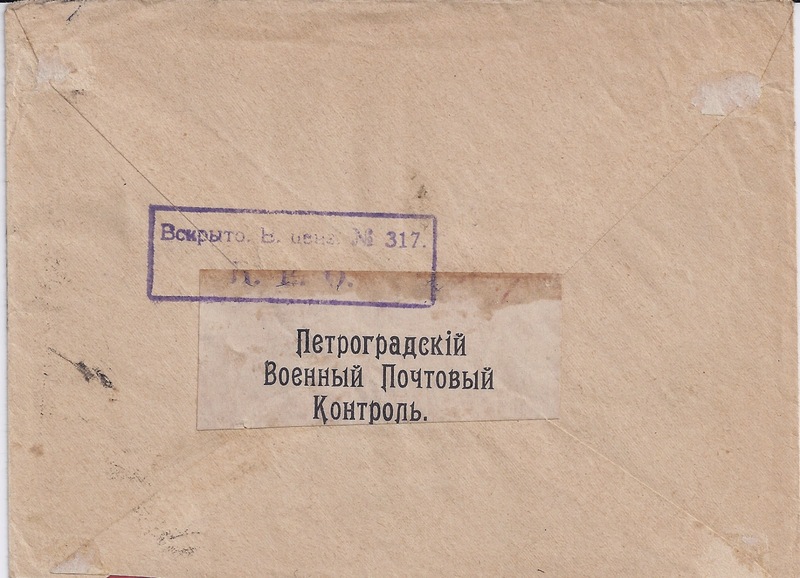 There is a cachet of the Address Bureau at bottom left and a central vertical line of glue which probably indicates that a SPRAVKA label has been attached during the attempts at delivery. The card has then been marked with French language (International) cachets for Return with addressee Unknown. Libau was occupied by Germany in 1915 and this would have been one of the first civilian items of mail to travel to Petrograd since the beginning of the Occupation. 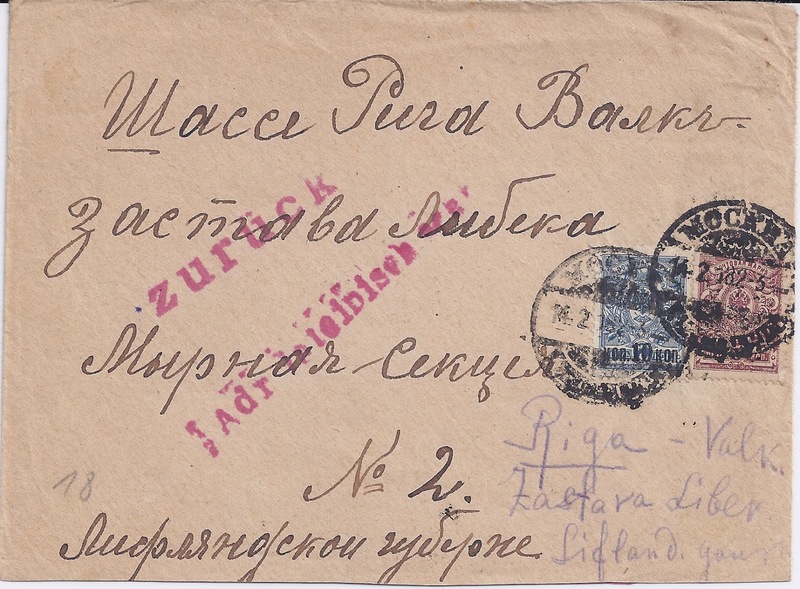 The third card, in Russian, starts in RIGA 30 1 18 with 10 Pf in franking on both the outgoing and Reply half. It's addressed to Dvinsk (Daugavpils, Dünaburg) and gets there on 28 1 18 (Old Style) where a mute receiver cancel without town name has been applied (this cancel I have seen before). From the fact that the address on this card begins with "Russland" in German, one can infer that Dvinsk at this point was on the Russian side of the armistice line. Since each of these three cards is differently franked, it cannot be inferred what the Tariff was supposed to be! Both envelopes started out from RIGA 23 1 18 one addressed in Cyrillic but with "Russland" in German, and the other in Latvian - both franked 20 Pf (so we might be tempted to infer the Tariff!). The handwriting is different, but the stamps may have come from the same sheet. They are both addressed to the Riga - Valk Highway, Libek Station [ Sastawa Libek - which in German would be tranliterated or translated as Lübeck - just as the German city of Lübeck is rendered LIBEK in Russian ], Peace Section No. 2, Iskolostrel [mis-spelt on the Latvian letter]. From Alexander Epstein's article in Yamchik, I learn that"Iskolostrel" is the acronym for the Executive Committee of the Latvian Rifle Regiment, a pro-Bolshevik unit. One possibility ( and Alexander Epstein also thinks this possible) is that these envelopes contained cards for onward transmission to Russia, the senders making use of the German civilian Ob Ost post to get the cards to an exchange point. Why they did this is a mystery, given that the other cards appear to have travelled without use of envelopes. The top cover is unsealed and the bottom cover looks like it has been sealed later (the rear flap is partly detached). Of course, these envelopes could have contained enquiry letters to Iskolostrel itself, for example, asking about the whereabouts or fate of members of the Regiment. Here is an ordinary letter, correctly franked, sent from MOSKVA 14 2 18, the first day of the new calendar and just a few days before the Germans withdrew from the Armistice agreement. It's correctly franked at the internal letter rate, probably sent unsealed but sealed by the Petrograd censor. It's also addressed to Station Libek but with no mention of Iskolostrel. 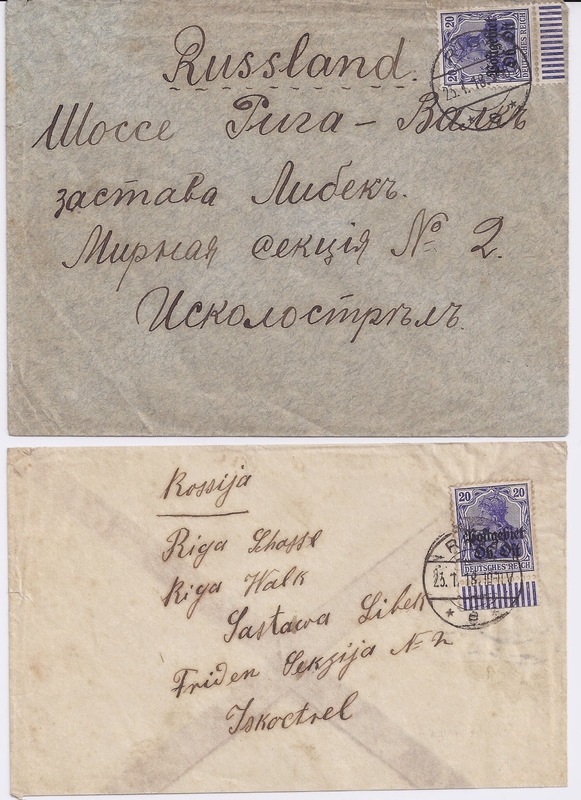 The handwriting is almost identical to the first envelope above sent from Riga, but there are small differences. It is marked in German "Züruck" on the grounds that the address needs to be in the Roman alphabet. Much scarcer than Russia Number 1 on cover?